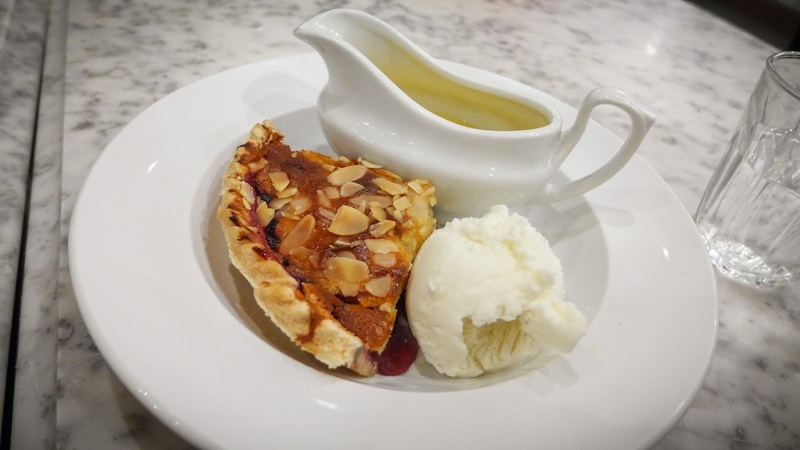 I’ve noticed of late a strong relationship between variable A: it being the school holidays, and variable B: me finding myself eating in places - how to put this politely? - well, places that I wouldn’t necessarily take someone I wanted to impress. I think it may be a matter not just of correlation, but of actual causation, the catalytic factor being variable C: the presence of kids. Last summer Mrs Diner and I sampled the delights of Pizza Express, all because we had custody of her nieces for one afternoon and they, for reasons that elude me, just love those dough balls. This half term I arranged to meet a friend who had her own Junior Diner in tow. “Somewhere in town that does kiddie portions, preferably with crayons,” she had requested. I thought hard. The presence, or otherwise, of crayons is not something that I typically note in my reviews. 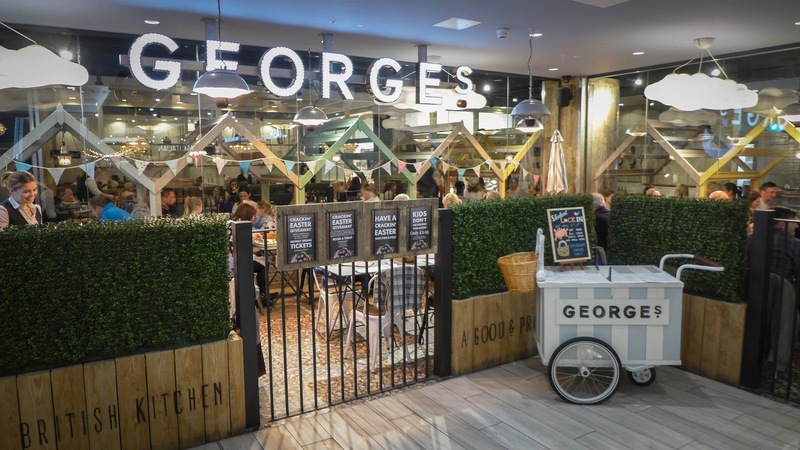 “What about that George’s place in Eldon Square we keep avoiding?” suggested Mrs Diner. It was all right for her – she wasn’t coming with us. 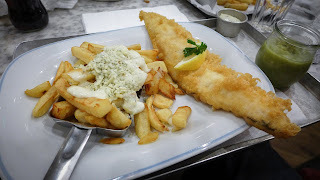 “Fine,” I said, realising I hadn’t had fish and chips in ages. “If we can smash through three courses before Junior gets uppity I’ll even do a review,” I said. And we did, and I am. 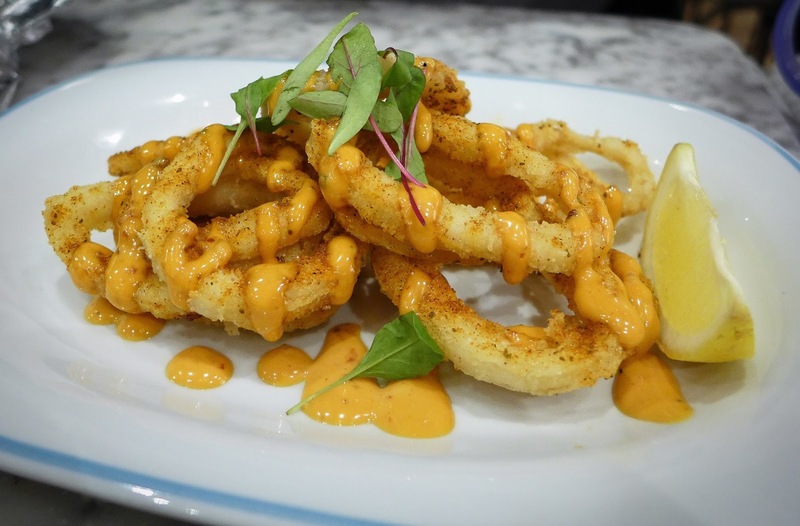 Having tried Chaophraya (alright-ish), Red's True Barbecue (OK), and Tapas Revolution (really rather good), I thought I'd finished my business with intu's Greys Quarter. 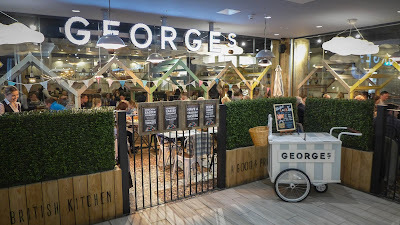 I’d walked past George’s Great British Kitchen innumerable times and clocked its faux-seasidey schtick and folksily bizarre claim to be “a good and proper place.” Wild horses couldn’t have dragged me inside, but a six year old did. 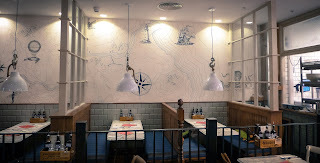 Now, as we wound our way round the various sections of tardis-like vastness to our table, I couldn’t help but be a bit impressed by their commitment to their seaside theme. Some tables are sort-of beach huts, named “Whitley Bay”, Saltburn”, “Bamburgh” and so forth; cocktails come with candy floss on top; light fittings are in the shape of anchors; the menu is a pretendy newspaper and there are massive soft toy fish around the place with which some people take selfies because the world has gone mad. It was a mild, but nonetheless welcome surprise that our waitress wasn’t dressed as a herring. For all that, it’s a light, airy space and I found the soundtrack of Pink Floyd, Oasis and Elton John classics soothing. The line on the food is “British classics with a unique twist” which explains why my Scotch egg came in “deconstructed” format. 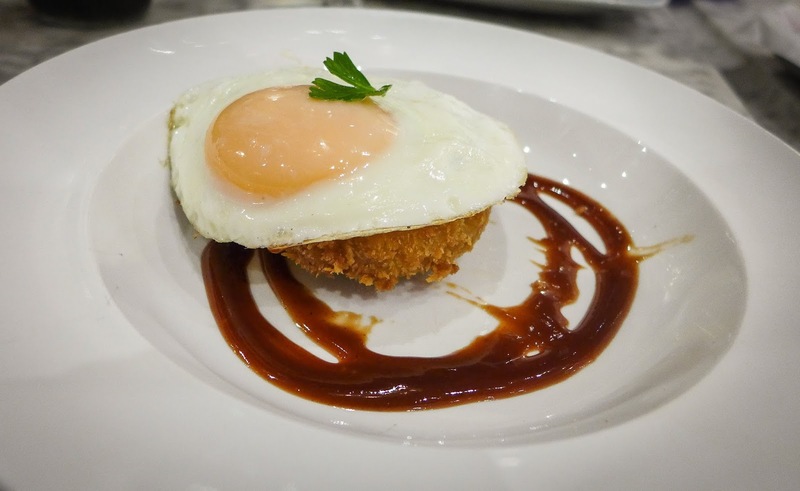 It was, in effect, half a fry-up: a nicely fried egg perched on a crumbed wodge of really delicious, leek-spiked and loose textured sausage meat on a swirl of brown sauce. Our friend’s squid rings were similarly good, tender and crisp in all the right places and made moreish by being seasoned with Old Bay, which isn’t remotely British, but who cares. 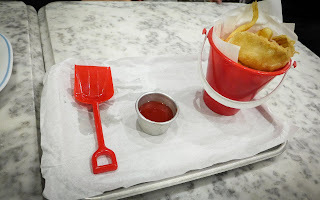 More important, having gotten all artistic with the crayons and had a fun time bopping us with a balloon, Junior was annihilating her kid’s portion of fish and chips, which arrived in a plastic bucket with a plastic spade for extra lols. All the staff were as lovely with her as they were pleasantly efficient at dealing with us. Which makes it a bit of a shame that the rest of the grown-up food wasn’t up to much. For a shade under fourteen quid, I’d expect fireworks from a portion of fish and chips, but the batter shell on my haddock was pallid rather than golden and lacked flavour. The fish inside was nicely cooked, which suggests some adjustment of oil temperature or portion size is required to get the thing in proper balance. It’s a thumbs up for the chips which were rustly crisp and fluffy within, but my decision to trade-up regular chips for Stilton chips proved disastrous, the blue cheese sauce having a weird processed flavour. Tartare tasted similarly industrial and lacked proper caper-derived tang. The friend’s rump steak was a total write-off, having that grim, boiled livery flavour that comes from poor quality meat having been “aged” by sitting in its own blood. It arrived with two halves of tomato, half warmed through and half raw. It was like a hot-lamped memory of any number of terrible hotel buffets. 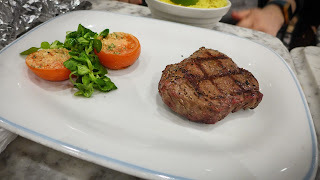 Weirdly, our waitress had said the steak couldn’t be cooked medium-rare, only rare or medium, a policy that I haven’t encountered previously and which suggests a complete lack of confidence in the kitchen’s abilities. I know for sure that the custard on our shared pudding was microwaved, having clocked a chef in the part-open kitchen snip open a carton of the stuff before nuking it (they must have ran out of the “carefully selected fresh ingredients” that the website boasts about); the limpid pastry on the Bakewell tart suggested it may have had a similar fate. I guess George’s is a viable option for somewhere to take the kids for a treat. 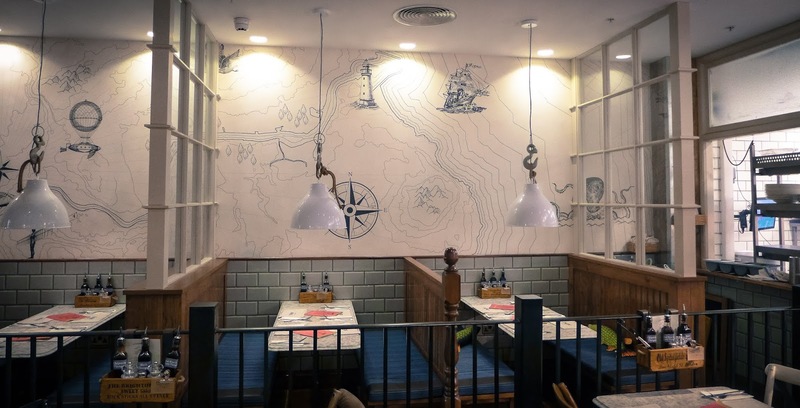 Staff were great, and the full beachageddon interior is either loads of fun or good to laugh at, depending on your mood. However, the bill came to about sixty quid for two-and-a-half of us, with one glass of wine and a diet Coke. That’s really pricey for what it is and, on the evidence of our lunch, they can’t be relied on to get key elements of even simple dishes right. There’s something like 120 covers in this place and they were turning tables fast. It’s sad that, when settling on somewhere to take the kids for lunch, people choose crayons over quality every time, and don’t chain restaurants just know it. I wonder where I’ll end up when the summer holidays swing remorselessly round again. Suggestions please.